6 articoli pubblicati con la parola (s) o la frase Gaastra in Notizie, Tendenze, Video, Gallerie fotografiche, Agenda e ordinati per "data discendente". Un anno dopo il suo acquisto da parte di ex azionisti, il Doniger Fashion Group è ancora in difficoltà. Il tribunale del commercio di Amsterdam ha nuovamente autorizzato la procedura di amministrazione controllata. Marina Yachting ha deciso di approdare anche sul mercato francese. Il marchio di origine genovese dall'ispirazione nautica ha affidato a Frédéric Caillot lo sviluppo della rete multimarca in Francia. ...gros et du retail de la marque sur l'Europe. Passé lors de ses précédentes expériences par Sole Technology, mais aussi Gaastra et O'Neill, il avait rejoint Volcom en 2011. ...charge des opérations pour Tommy Hilfiger Europe.Le groupe avait nommé il y a peu déjà Oliver Frielingsdorf à la tête de Gaastra, sa deuxième marque d’inspiration maritime. ...The investment fund has cancelled plans to relaunch fashion chains McGegor, Gaastra and Adam. For now, McGregor and Gaastra stores will remain open. Adam brand stores will close. ...McGregor, Gaastra and Adam will start afresh under Du Soutien Beheer, led by Rens van Schoor. It is the second relaunch for the Dutch fashion chains. ...The Dutch group, notably the owner of the McGregor and Gaastra brands, asked for and was granted longer payment terms by the country's commercial courts. ...Doniger Fashion Group durch neue Investoren, wurde jetzt entschieden, dass die betrieblichen Aktivitäten der Marken Gaastra und McGregor eingestellt werden. ...neuen Investor übernommen, der einen Investmentfonds gegründet hat, um damit den Geschäftsbetrieb der Marken McGregor, Gaastra und Adam Brandstores zu sichern. ...Das niederländische Unternehmen Doniger Fashion Group B.V. hat für sich und die Tochtergesellschaften Gaastra, McGregor und Adam in den Niederlanden Gläubigerschutz beantragt. ...Der niederländische Konzern, zu dem auch Gaastra gehört, erwirkte einen Zahlungsaufschub, um seinen Geschäftsbetrieb weiterführen zu können. Wie es mit den europäischen Filialen weitergeht, steht noch offen. ...В крупнейшем аутлете России Outlet Village Белая Дача открылся магазин международного бренда Gaastra. 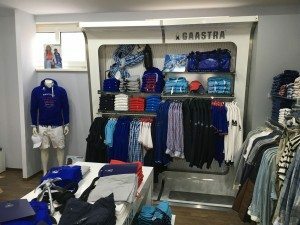 ...Oliver Frielingsdorf has been appointed the new CEO of Gaastra, the sailing/lifestlye brand from the Dutch group McGregor. ...Newport Footwear, a subsidiary of the Dutch company Star Collections. A change in direction for Gaastra, which integrated this activity in 2010. ... was recently in charge of the brand's wholesale and retail sales in Europe. He formerly worked at Sole Technology, Gaastra and O'Neill, and joined Volcom in 2011. ...in charge of operations for Tommy Hilfiger Europe.McGregor has recently appointed Oliver Frielingsdorf at the head of Gaastra, its maritime-inspired second brand.